I still haven't played with the FOV settings much (at all), but I thought you guys might be interested in the gauges. I am going to try and hook it up to my ski soon as I think that will be far more interesting than what the boat is doing. I thought a chesty might be cool too. Anyway, this is my first full pass @ 28mph, which is where I left off last season. Hoping to build on it from there! That is pretty cool. It would be neat see how accurate it is to show how a skier accelerates and decelerates and what angle they get wake crossing. Neat technology. That data is junk. Video quality is nice. 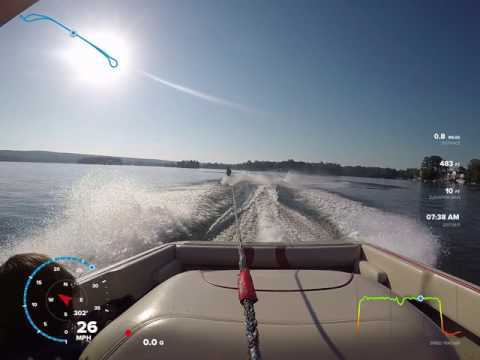 The camera can stay in the boat, but the sensor should be on the skier. Not sure if that's possible.